"I was referred to Melissa from a family member who sees her after having had an automobile accident. I have had a few issues in the last few months and she has / and is really helping me get better. She really knows what to do for the problem you have. She works me hard, but I feel so much better when I leave there, it is worth it. She is very professional, very courteous and understanding. She also shows you what kind of exercises you can do at home to get better. The office atmosphere is very relaxing, and super clean! I am so fortunate and thankful to have found her as I have never seen an athletic therapist and really wasn't sure if it would me and it sure has. Thank you Melissa and keep up the good work!" My name is Djennifer and last week I was in an accident (car head on accident on Taylor Avenue). I believe a woman named Melissa came to see what had happened and provided me with a ton of information in regards to the pain I was having from the accident. She comforted me since I was in a panic and had my son in the car. I just want to tell her thank you and I appreciate her help and gives me belief that there are caring people still on this world. 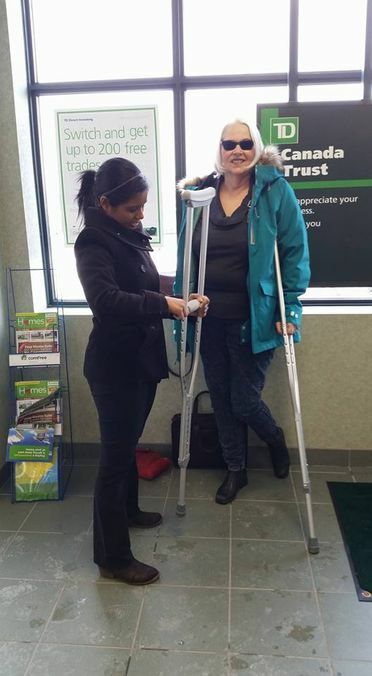 "Today, my mom and I went to a TD bank branch in Winnipeg. 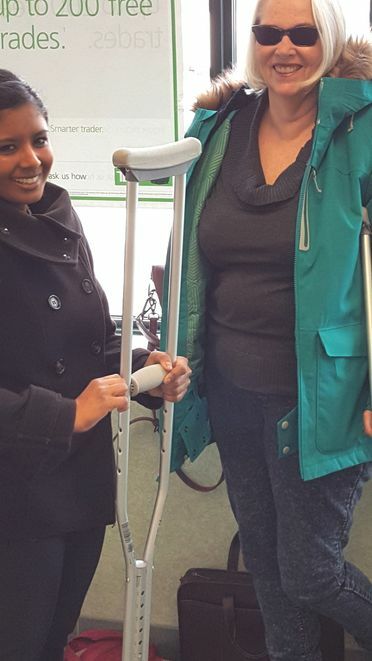 Mom is using crutches because of problems she is having with her heel. As she stepped into the bank, she slipped on some wetness from melted snow and put her sore foot down hard to stop herself from falling. Of course, this hurt a lot and she cried out. 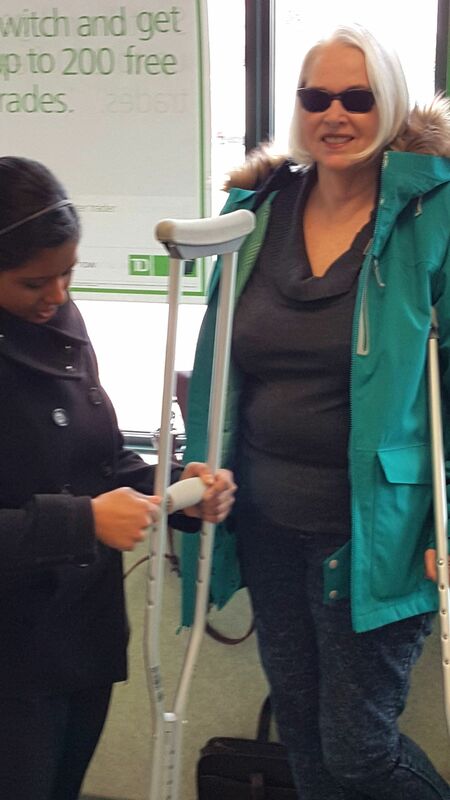 A woman came over and introduced herself as an athletic therapist and offered to help. She noticed that Mom's crutches were not set at the right height (thanks Misericordia urgent care). And offered to help set them up right. She started pulling them apart on the spot in the bank and getting them all set up. When she couldn't get one of the bolts out to adjust the handle, she got one of the bank staff to go get a hammer. Then, once they were all adjusted, she described some therapies that mom could try to resolve the problems with her heel and gave her a lesson in using the crutches properly so maybe she won't slip on them as easily. The woman took lots of time to patiently explain everything to mom. The staff at the bank were very friendly and didn't mind at all that we were having an informal clinic in their lobby. Big thanks to Melissa Deonaraine, our very helpful athletic therapist and to Brendan Benoit, the TD Bank staff who helped us hammer that bolt out." "I can't thank her enough how the pain subside after just my first session with her for being in pain for 18 days after a car accident. I highly recommend Melissa! She's very professional and thorough with her examination before starting the therapy. She will assess everything that will help you recover with your injury. Melissa is doing great!" "With her extensive knowledge and experience, Melissa is able to provide extremely effective treatment, in a professional, caring manner. After receiving treatments and following her exercise prescriptions, I have recovered from my injuries, and this has allowed me to return to my full activities. I would certainly recommend Academy Athletic Therapy!" "I have known Melissa long time and i would recommend Academy for all athletic therapy needs for high performance athletes all the way to your average person needing some guidance and rehab or prevention work"
"Melissa is a professional in every sense of the word! She will treat what ails you and set up a plan to help your treatment move forward and the issue getting resolved! If you need to see an AT, she is the one to go to!"